Sat, December 1, 2018 10:00 A.M. 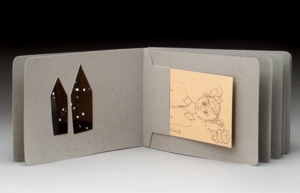 The Record Book is built out of a series of cut and folded paper pockets, and the "stackability" of the pockets provides the spine and structure of the book, as well as the ability to open flat. This book makes room for housing many delights--recipes, self-portraits, love notes, directions. Another lovely Hedi Kyle structure to be learned and adored! Students in this workshop will make a model and leave with the knowledge of how to make more in varying sizes.